This tutorial helps students boost their success rate in solving accounting exam questions. Each chapter begins with a clear definition of learning objectives and provides a framework for achieving those objectives. The authors alert readers to common pitfalls, remind them of key terms, concepts, and relationships, and explore the intricacies of complex accounting situations and how to address them. 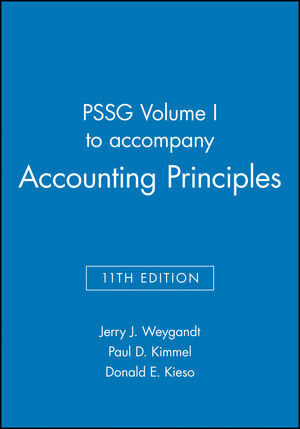 The book features numerous exercises, along with multiple choice questions typical of those found on accounting exams—with fully-worked solutions—as well as in-depth explanations of how the solutions were derived and why. Donald E. Kieso, PhD, CPA, received his bachelor's degree from Aurora University and his doctorate in accounting from the University of Illinois. He is currently the KPMG Peat Marwick Emeritus Professor of Accounting at Northern Illinois University. He has public accounting experience with Price Waterhouse & Co. (San Francisco and Chicago) and Arthur Andersen & Co. (Chicago) and research experience with the Research Division of the American Institute of Certified Public Accountants (New York). He has done postdoctorate work as a Visiting Scholar at the University of California at Berkeley and is a recipient of NIU's Teaching Excellence Award and four Golden Apple Teaching Awards. Professor Kieso is the author of other accounting and business books and is a member of the American Accounting Association, the American Instutute of Certified Public Accountants, and the Illinois CPA Society. He is currently serving on the Board of Trustees and Executive Committee of Aurora University, as a member of the Board of Directors of Castle BancGroup Inc., and as Treasurer and Director of Valley West Community Hospital. Paul D. Kimmel, PhD, CPA, received his bachelor's degree from the University of Minnesota and his doctorate in accounting from the University of Wisconsin. He is an Associate Professor at the University of Wisconsin -Milwaukee, and has public accounting experience with Deloitte & Touche (Minneapolis). He was the recipient of the UWM School of Business Advisory Council Teaching Award and the Reggie Taite Excellence in Teaching Award, and is a three-time winner of the Outstanding Teaching Assisting Award at the University of Wisconsin. He is also a recipient of the Elijah Watts Sells Award for Honorary Distinction for his results on the CPA exam. He is a member of the American Accounting Association and has published articles in Accounting Review, Accounting Horizons, Advances in Management Accounting, Managerial Finance, Issues in Accounting Education, Journal of Accounting Education, as well as other journals. His research interests include accounting for financial instruments and innovation in accounting education. He has published papers and given numerous talks on incorporating critical thinking into accounting education, and helped prepare a catalog of critical thinking resources for the Federated Schools of Accountancy.